What could Alex Ovechkin possibly do for an encore after winning his first Stanley Cup? On the night of July 18 at the ESPY Awards, "The Great Eight" found a way to deliver another memorable moment. 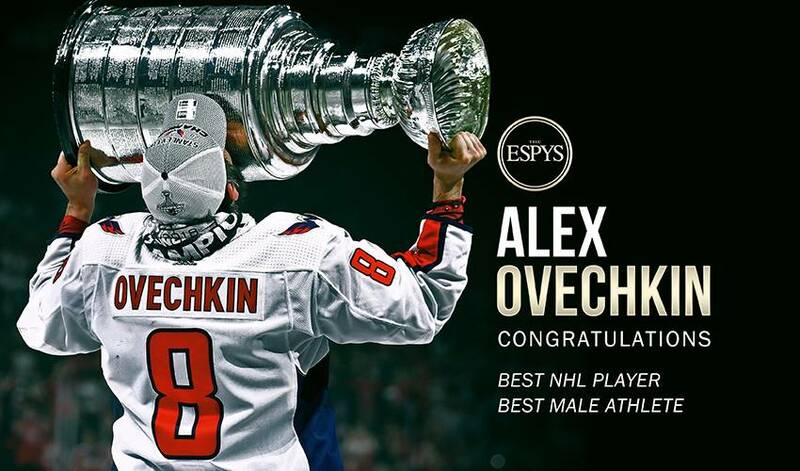 After netting a trio of top-shelf NHL trophies – his record seventh Maurice “Rocket” Richard, first Conn Smythe (playoff MVP) acknowledgment, and a Stanley Cup championship – Ovechkin was the recipient of the Best Male Athlete and Best NHL Player at ESPN’s annual awards show known as the ESPYs. Launched in 1993, the ESPYs gather top celebrities from sports and entertainment to commemorate the past year in sports by recognizing major sports achievements, reliving unforgettable moments and saluting the leading performers and performances. Ovechkin managed to outduel some serious competition at the 2018 ESPYs. This time, however, he didn’t need to lace up his skates. The three-time Ted Lindsay Award winner (the most outstanding player as chosen by fellow NHLPA members) totaled more votes than NFL megastar Tom Brady, NBA superstar James Harden, and MLB standout Jose Altuve for Best Male Athlete. Ovechkin topped a stellar list of NHL players (Sidney Crosby, Marc-Andre Fleury, and 2017 and 18 Ted Lindsay recipient Connor McDavid) to win in the Best NHL Player category. In winning the Best Male Athlete, Ovechkin became the first NHL player to receive the honour. While he wasn’t on-hand to receive his hardware, actress Kate Beckinsale accepted the award on his behalf. Brett Connolly is thrilled to see his teammate in the spotlight again. Following his 49-goal season in 2017-18, the 32-year-old winger is now tied with Bobby Hull for the most times a player has led the NHL in goals in a season. In the Stanley Cup Playoffs, Ovechkin became the first Russian player to captain a Stanley Cup Championship. He ranks first in franchise history in goals (607), points (1,122), power play goals (229), game-winning goals (102), overtime goals (22), shots (4,896) and multi-goal games (120). Connolly might top his teammate, however, when it comes to making a fashion statement. Since starting his NHL career in 2005-06, Ovechkin leads the League in goals (607), points (1,122), power-play goals (229), power play points (436), game-winning goals (102) and shots (4,896). He became the second player since the 1967-68 expansion era to lead the NHL in goals at the age of 32 or older (Phil Esposito twice led the League in goals before his 33rd and 34th birthday). Ovechkin notched his 1,100th career point (592 G, 508 A) on February 15 against Minnesota, becoming the 61st player in NHL history to reach the 1,100-point mark. He achieved the feat in his 978th career game.